If you are looking for a great new way to combine developing your body and your mind at the same time then look no further than Cy-Yo. Utilizing a new way to exercise, Cy-Yo is a combination of cycling and yoga. Cy-Yo is not only an intense workout that burns fat reduces stress and improves the body, but it is also a way to give you some peace of mind and release negative energy, replacing it with positive energy. During a Cy-Yo workout, you will find a connection between your body and mind and you can use that connection to reach the best benefits for overall well-being and health. With Cy-Yo, you can truly live a happy and healthy life. Basically it is a workout that combines both cycling and yoga to create a workout that benefits both the body and the mind. It was developed by Curt Dalton, A fitness expert near Boston, Massachusetts who specialized in (yea you guessed it) cycling and yoga. Dalton wanted to find an exercise that took the intensity of Western exercising and combined it with the Eastern belief that the body and mind are connected and reliant on each other. By using these two philosophies, he combined the vigorousness of cycling and the calming, peaceful nature of yoga to create a form of exercise that not only improves cardio and burns fat, but it also helps with the mind and spirit. Cy-Yo sessions last one hour and begin with a 10 minute yoga warm up. This warm up helps to relax the mind and the body and prepare you mentally and physically for exercise. After yoga, you will cycle for 40 minutes, but it isn’t normal cycling. While exercising, you must pay attention to your energy center and release negative energy through proper breathing. After the cycling class, a 10 minute yoga cool down finishes the class. This helps to not only cool the body down, but it also refocuses your mind on positive energy. It has been steadily gaining more and more interest since it was developed. In today’s busy and stressful world, it is important to find ways to relax the body and mind. Cy-Yo is a perfect way to not only stay healthy and fit, but it is also a great way to center your body and mind and let you feel a general well-balanced health. As more and more individuals try it out and discover the great benefits and healthy results, it will only become more and more popular among anyone wanting to find health and peace. The point of Cy-Yo is to link the body and the mind to improve both and find an all-over sense of health and happiness. The basic belief behind it is that the body and mind are connected. In order to have a healthy mind, you must have a healthy body, and in order to have a healthy body, you must have a healthy mind. The techniques used in Cy-Yo, help to make you aware of your body and mind and let you reach a higher level of healthy living. Only through calming the mind can you truly reach top efficiency when exercising. Cy-Yo allows you to release negative energy while cycling and replace it with good positive energy. This not only helps to give you better results, but it also improves the health of your mind and spirit. Negative energy and stress can lead to serious health concerns, including high blood pressure, alcoholism, sexual dysfunction, insomnia and acid peptic disease. By connecting the body and mind, you can ensure that you are improving your mind as well as your body during exercise. When you go to try out your first class, you might not know what to expect, but it isn’t too different from any other cycling class. The only difference is that you must also focus on your mind not only your body as you exercise. This could be difficult for people who are used to standard Western exercise, so it may be difficult at first to pay attention to your mind. The class will begin with yoga. A 10 minute yoga warm up will get the blood flowing and the muscles warmed up to avoid injury during cycling. However, the yoga is meant to serve as more than a simple warm up. The yoga is also a means to open the energy centers in your body and allow you to find a peaceful state of mind before cycling. By relaxing your mind and finding a peaceful state, you will see better results during the cycling portion of the class. After yoga, you will move on to the cycling portion of the class. This portion is much more intense than the yoga and allows you to increase heart rate, improve overall health and lose weight. However, as with the yoga, there is more to it than simple cycling. During this time, you must focus on your body and your breathing. Using visualization techniques and breathing patters, you can target stress zones and even reduce stress. You must also release all your negative energy, replacing it with positive energy and detoxify your body to increase your energy fields. These will leave you with better results for both your body and mind. The last portion of the class is another 10 minute yoga workout. This is used to help the body cool down after cycling to ensure you do not obtain injury. Of course, like with the yoga warm up, there is another layer to this cool down. The yoga will also relax and refocus your mind. Since Cy-Yo is an exercise that focuses on the body and mind, you can think of the yoga warm up and cool down for your mind as well as your body. It gets the mind ready and open for optimum exercise results and then it relaxes it again after cycling. One of the most important elements to the Cy-Yo class is music. The music is usually more energetic than usual yoga music. It is designed to help increase your heart rate and assist you in releasing negative energy and pulling in positive energy. The most popular forms of music are Celtic tunes. There are many different benefits to Cy-Yo. The most obvious are general health related that you will get through basic cycling and yoga. 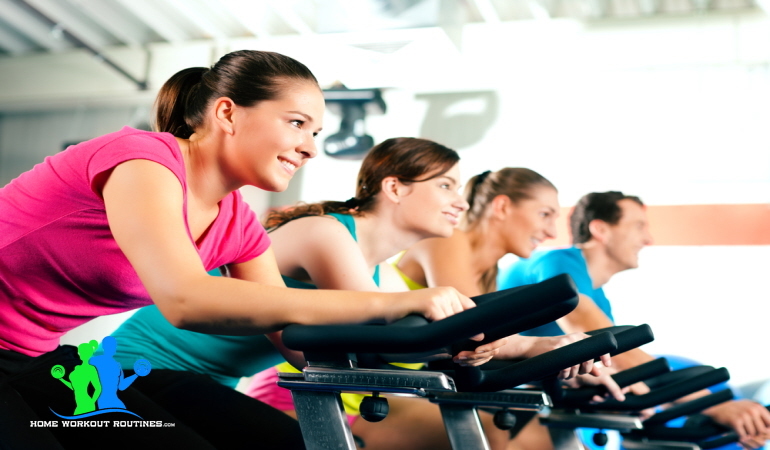 • Heart Health – Aerobic exercises such as cycling help to improve the overall health of your heart. It can help protect you against high blood pressure, heart disease and high cholesterol. • Muscles – Both cycling and yoga help to improve your muscles. Cycling can help build and tone muscles in the lower half of your body, and yoga can also help tone muscles all over your body, depending on the yoga position. • Weight Loss – Like other high-intense activities, cycling can help to burn fat and keep it off. It even helps to improve your metabolism. This can help to lower your risk of diseases like diabetes. • Lifespan – Cycling and yoga help to increase your lifespan by giving you a healthy body with lower risk of common diseases. • Coordination – Both Cycling and yoga can help with coordination and balance. • Immune System – Cycling helps to strengthen your immune system. It is also believed that it may help reduce your risk for some types of cancers. • Spine Health – Yoga is a great way to improve your spine. Many of the positions help to strengthen your back and the muscles that help support your back. • Better Sleep – Exercise also helps with improved sleeping habits by using excesses energy that might keep you awake. It also helps because it tires out your body and forces it to relax and rest at night. • Mental Health – Exercise helps to improve your mental health and puts you in a better state of mind. • Self-Confidence – Cycling and yoga are a great way to build self-confidence. Not only does exercising make you feel better about yourself, but the physical results will give you more confidence in your appearance. These general benefits to cycling and yoga are great, but when cycling and yoga are combined to form Cy-Yo, those results are even better. By putting you in a great state of mind before, during and after cycling, a Cy-Yo class ensures that you will produce the best results from exercise. Secondly, the mental health from Cy-Yo surpasses regular exercise. Not only do you get the normal benefits, but while you exercise, you are actually specifically working to improve your mental and spiritual well-being. By releasing negative emotions and replacing them with good ones, you detoxify your body from all the stress and negativity of life, which will result in a happier you. Why is Cy-Yo so Enjoyable? You will love Cy-Yo because it takes two fun exercises and combines them for fabulous results. The peaceful feeling you discover during Cy-Yo and the peace of mind that results makes it a great way to stay fit. Not only will it give you that euphoric feeling that comes with exercise, but the yoga warm up, release of negative energy and yoga cool down will help to intensify it even more. Cy-Yo will make exercise fun because it will put you in a great mood and state of mind. This is definitely a great way to stay fit in both body and mind. It allows you to find a link between your mental health and your bodily health to create an exercise regimen that will give you the best results possible. Cy-Yo is certainly gaining in popularity, so it will be around for quite some time to come. The great combination of cycling and yoga make Cy-Yo something that really works and isn’t a gimmick. These workouts are something that you can do in the comfort of your own home once you learn how to do them. So don’t be afraid to give one of them a try and you may well discover a new well-balanced you.